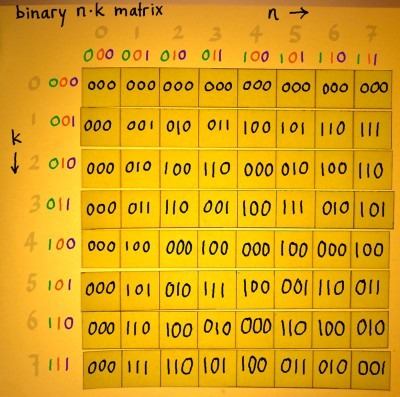 This pages shows matrix illustrations with indexes in binary numbers. 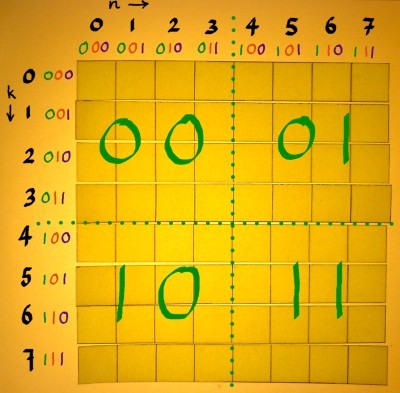 Each bit in a binary integer represents a power of two which can be present or absent. This is how index values live in a computer. 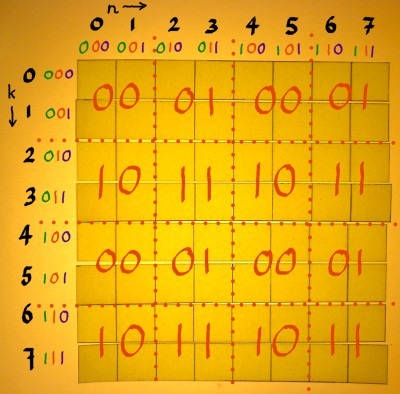 There is all kinds of bitwise operations and manipulations that you can do on integers. Such operations are elementary and fast. So you can save a nanosecond here and there. (After spending precious hours to find out how). This pattern is continued till the finest resolution level. I want to illustrate a frequently used example of bitwise manipulation. Say we multiply row indexes by column indexes like it is done to find the powers for Wkn of the Fourier matrix. 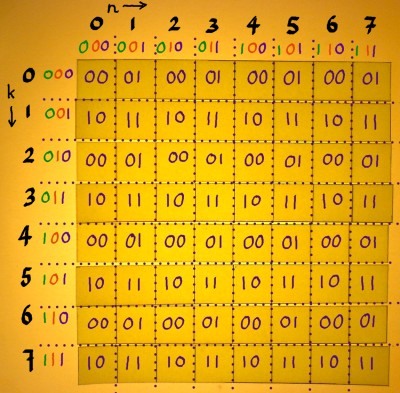 Below is an example matrix for N=8. Only three bits are of concern. When we mask the more significant bits that are in a datatype, we see only the 'remainder' as it would show up after modulo N division. For example, binary 111*110=101010. The three least significant bits are: 010. And 7*6 modulo 8 is 2 indeed. Masking bits is a very easy operation, using a bitwise-and with N-1. Computing a modulo N division for N not being a power of two is much more complicated. The values 4 and 3 are additive complements within 7. In general, n and (n^N-1) are additive complements within N-1 for N being a power of 2. The ^ character is the C syntax for the exclusive-or operation. I am still in the process of discovering ways to employ bitwise negation. Examples are on the pages Bit Reversal and Inverse FFT. The bit representing 8 or 23 will always be set by the inclusive-or, so values without this bit set are excluded from the sequence. In a decrementing sequence this would result in an infinite loop. A very simple routine exist, to extract this least significant set bit from a bit pattern. I have learnt this from topcoder.com, see http://www.topcoder.com/tc?module=Static&d1=tutorials&d2=bitManipulation. Simple as it may be, I like to do an illustration of these operations. Subtracting 1 from n clears the least significant set bit in n, and it sets all less significant bits high. In the example that happens with the least significant bit. 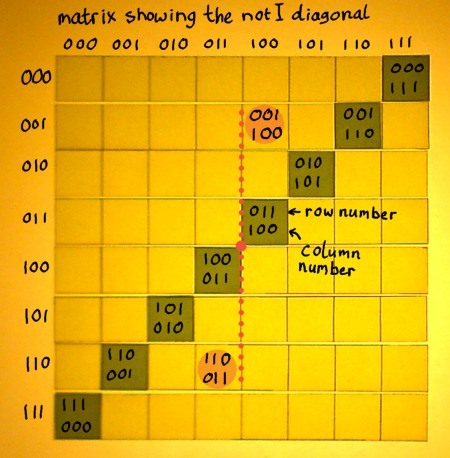 Of n-1, all bits should be inverted with bitwise-not, which is written ~ in C. For the example, it is ~13. ~13 is 4294967282 when using a 32 bits unsigned integer datatype. It is also (232)-1-13. When 14 and ~13 are bitwise-anded, only one bit remains set. That is the least significant set bit in 14. It represents 21, being just 2. 000 do not try to count the trailing zero's in zero! So far I have plotted quite some bit patterns, but what is the use of it all? To be honest, I don't know. That is, I am still in the process of exploring. You can find applications for the above mentioned patterns on my FFT pages. That is all I have at the moment. I documented the plots and codebits so I can stare at them every now and than. Soon as I have more, this page will be updated.